1 to 10 and 19 to 28: Odd numbers are red and even are black. 11 to 18 and 29 to 36: Odd numbers are black and even are red. The numbers aren’t in order on a roulette board, only to ensure that the color pattern of the wheel goes red/black all the way around. The roulette wheel offers a variety of odds for a player to either play it safe and progressively make money, or make it all in one go. 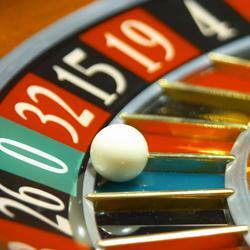 There are over 20 different types of bets a player can wager in roulette, with a variety of different payouts. Betting on a green space (“0” or “00”) or betting on any number (1-36) will pay out a hefty 35/1. Any bet on a black or red space, or an even or odd space, will pay the player 1/1 odds. The house edge in roulette is minimal, at roughly 2%. The excitement of the wheel is unmatched in a casino. When the white ball hits the wheel, all the players hold a collective breath as their fate rests on a lucky number and fortuitous bounce. As mentioned above, the house odds aren’t huge and you’ll have a variety of ways to make money. Roulette is as simple as a casino game can get, so any learning curve won’t be nearly as steep as say, poker or Texas Shootout. Also, as a quirky fact, the sum of the numbers on a roulette board totals to 666.